Cook pasta to desired doneness as directed on package. Drain. Meanwhile, heat oven to 325°F. Spray 13x9-inch (3-quart) glass baking dish with nonstick cooking spray. In blender container, combine sour cream, cottage cheese, flour, milk and eggs; blend well. In large bowl, combine ham, bell pepper and celery; mix well. 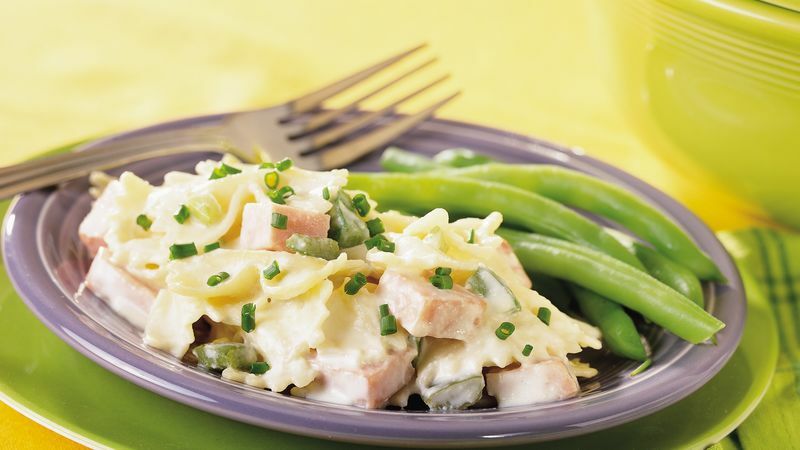 Add cottage cheese mixture and cooked pasta to ham mixture; mix well. Pour into sprayed baking dish. Spray sheet of foil with cooking spray; place, sprayed side down, over baking dish. Bake at 325°F. for 50 to 60 minutes or until thoroughly heated. Stir before serving. Select a stalk of celery that is heavy for its size. Celery should be light green; the darker green stalks can be stringly and touch. Pasta nuggets (radiatore) or rotini can be used instead of bow tie pasta.